can I get a BOOOOM up in here!?!?! 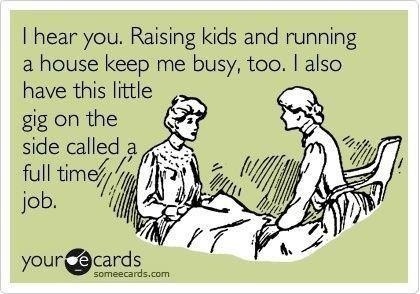 issue, realize that a good mom will do whatever it takes to care for her children. Loving, protecting and caring for your children defines what kind of mother you are and I don’t think all the judgment sets a good example to children, no matter where you “work”. Bahaha! You need to bring the ghetto out more often, I like it! I can see both sides of the coin here. Working all day outside of home with a husband that is always out of town is exhausting. It is difficult to find a balance in life. I feel like I have a million chores to do when I get home and I want to spend time with my child and do fun projects with them. I feel like I spend all weekend catching up on cleaning, shopping and yard work and then it already Monday again and back to work I go. I dont discredit how difficult it is to stay at home with baby either. Whatever situation you are in, you will always feel you are lacking in some way or another. Life is tough. In addition, ALL moms are amazing. We are the backbone of a family and balance all the life situations and continue to sing our song. I have been both and they are both equally difficult. Exactly, I think we are arguing the same point… Nothing is rainbows and puppies all the time, you take the good with the bad. Regardless of where we “work”, we are all moms who are doing what we feel is best for our children and need to stand together instead of finding reasons to bash each other. Amen! I always thought I’d be so much more productive if I stayed home but when it comes down to it, I still have to choose between cleaning and sewing (need vs want). And sadly, cleaning usually wins. 😦 Everything is so much more difficult with a little shadow making another mess as fast as you clean up the first one.